On April 2, 1865, 150 years ago today, the Third (and last) Battle of Petersburg took place, concluding with the evacuation of Richmond and Petersburg after 9 ½ long months and the end of the Siege of Petersburg. Two main attacks were scheduled for 4 am in the morning on the Ninth Corps (Parke) and Sixth Corps (Wright) fronts. All other commands were to be held in readiness to support any breakthroughs made in the main assaults. Before we get to the four main combats during the day (The Breakthrough, Battle of Ft. Mahone, Battle of Fort Gregg, and Battle of Sutherland’s Station), let’s take a step back and look at what happened on April 1, 1865, the day before. If you’ve been following along on this journey with me, you’ll have read my coverage of the Battle of Five Forks. At that battle, Phil Sheridan’s Cavalry and Gouverneur K. Warren’s Fifth Corps had routed a joint infantry/cavalry command under Major General George Pickett, driving them west and away from Robert E. Lee’s main army. To make matters worse for the Confederates, Lee had tried to reinforce Pickett with three additional infantry brigades, but they had failed to make it in time to factor into the battle. All of these troops sent west to deal with Sheridan meant Lee’s main lines surrounding Petersburg along with the Boydton Plank Road and White Oak Road lines to the southwest were extremely thin. As he mentions above, once Grant heard of the results at Five Forks he ordered an assault all along the Petersburg lines at 4 am. The truth, as it always is, was a bit more complicated than that. Though Grant did indeed want to assault all along the lines, and immediately that evening rather than at 4 am, his army and corps commanders faced realities on the ground. Humphreys and Ord on the left center didn’t feel like they could successfully attack with their forces. Neither did Godfrey Weitzel and the 8,000 men he could spare north of the James. Sheridan, and with him the Fifth Corps, were expected to move to cut off any Confederate retreat on the roads leading west from Petersburg south of the Appomattox River. This left two corps in the center, the Ninth under Parke and the Sixth under Wright, who indicated any chance of success. So that was that. 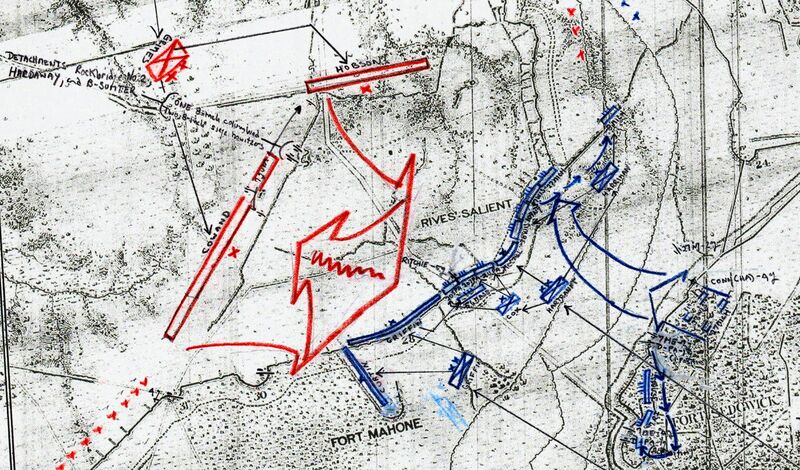 Parke and Wright were dutifully notified by Meade to open at once with artillery and probe with skirmishers, looking for an opening to attack immediately, rather than follow his original orders to assault at 4 am. Ultimately however, after some back and forth, it was ultimately decided just to stick with the 4 am assault, and Grant acquiesced in this decision. Ninth Corps commander John G. Parke held the Union lines south of the Appomattox River to just west of the Jerusalem Plank Road and Fort Sedgwick. Sixth Corps commander Horatio Wright continued this line to the area where the Fifth Offensive took place in September-October 1864 near Peebles’ Farm. Each commander was given discretion as to the size and location of his attack(s). Parke, oddly, picked the strongest Confederate location on his lines, Fort Mahone, to be the target of his assault. He left Willcox’s Division to hold the far left and make a demonstration east of Petersburg, while he concentrated Potter and Hartranft on either side of Jerusalem Plank Road, allowing them to maintain proper direction in the pre-dawn darkness. Preparations proceeded throughout the night. Wright chose to concentrate all three of his divisions in a massive and narrow attack which would proceed northwest from Fort Fisher and Fort Welch, the rest of his lines held by skirmishers and artillery. He was confident his corps would “make the fur fly” (OR XLVI, P3, p. 423) and quickly capture the Confederate intrenchments when they stepped off to the attack. By morning, both corps were ready. The final battles for Petersburg were about to begin. An assault upon the enemy’s work in front of Fort Sedgwick will be made at 4 a. m. to-morrow by the Second and Third Divisions and the First Brigade of the First Division. I. Brigadier-General Hartranft, commanding Third Division, will mass his division in rear of the line between Fort Sedgwick and Fort Rice by 3 a. m.
II. Major-General Potter, commanding Second Division, will withdraw his division from the line and mass it in rear and to the left of Fort Sedgwick and on the left of the Third Division at the same time. III. Major-General Willcox, commanding First Division, will withdraw his First Brigade, Colonel Harriman commanding, from the line and mass it on the right of the Third Division at the same time. IV. Major-General Willcox and Major-General Potter will leave their picket-line out and garrisons in the forts. V. At 4 a. m. the entire picket will advance, endeavoring to hold all ground gained and the assaulting columns will charge. Strong pioneer parties, provided with spades and axes, will be arranged by the commanders of divisions. VI. Major-General Willcox will hold his other two brigades in readiness to advance upon the enemy’s work in his front on receipt of orders. They will not be withdrawn from the line till further orders. VII. Quartermaster’s, commissary of subsistence, and medical departments will make their dispositions accordingly. “At 4.50 p.m. April 1 I received orders from army headquarters, through Captain Worth, directing me to assault together, and, after fully examining the grounds, substantially the same arrangements for the assault were made as had been previously made for the assault ordered for the morning of [March] 31st. At 9.50 p.m. orders were received by telegraph from General Meade directing me to at once open with all the artillery in my front, push forward skirmishers, and follow them with columns of assault. While arrangements were being made to carry out these orders they were modified by further instructions withdrawing the orders for instant attack, and making assault contingent on developments of weakness on the part of the enemy. We opened artillery and threw forward a strong skirmish line along the whole front. The enemy was found prepared and in full force with the exception of in front of the Second Brigade, Second Division, Brigadier General S. G. Griffin’s, between Forts Hays and Howard, when General Griffin, by a well-planned rush, succeeded in surprising and capturing about half a mile of the enemy’s picket-line, taking prisoners 8 officers and 241 men, but further movements disclosed the enemy’s main line well manned and on the alert. 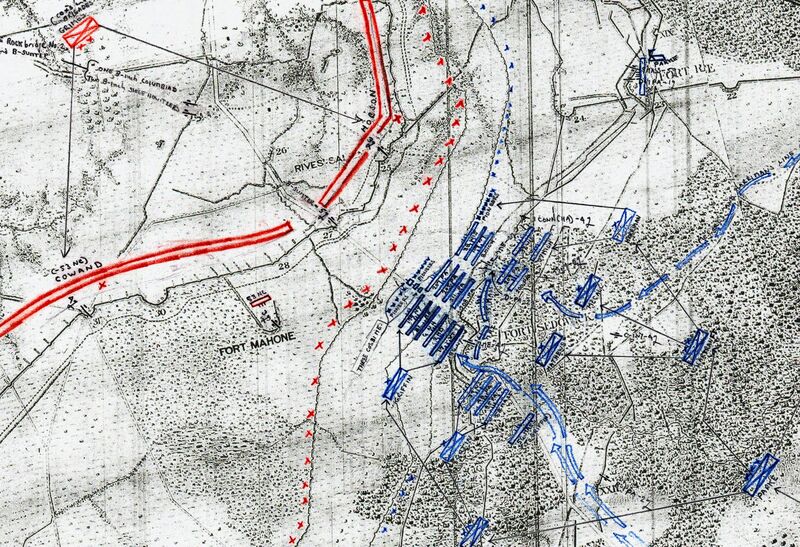 The demonstration developed no apparent change in the force in our front either of artillery or infantry. IX Corps Assault on Fort Mahone, 4:30 am, April 2, 1865. Click on the Map for a Zoomed in View. After an initial artillery bombardment at 4 am, Willcox carried out the diversion near the Appomattox. His feint captured some of the Rebel skirmish line near the crater, and even managed to take about 250 yards of their main line nearer the Appomattox River. They were soon driven out, however, due to lack of numbers. Perhaps, given the results, Parke might have been better served by staging his assault right along the Appomattox. On the other hand, Parke had heard the Confederates were expecting an attack near Fort Stedman due to the proximity of the opposing lines, hence the decision to make an attack in a completely different front. “At last the signal came along: ‘Four o’clock and all is well.’ First making sure that my party were all on the alert and ready, we moved ahead at a quick step over ground that was fairly good at daylight, but in the dusk of morning it seemed rough and uneven. Nothing could be distinguished beyond a few paces in front. We reached our picket lines and could then tell about how far we were from those of the enemy. All was quiet in that direction. We hoped to surprise their pickets, capture what were in our way, and then rush right ahead to their main works. So we marched on, uncertain whether we were moving faster or slower than the division that was supposed to be moving on our right beyond the [Jerusalem] Plank Road. This did not matter however, as my orders were not made dependent on the connections. At length the intrenched line of the enemy’s pickets became visible not many yards in our front, when without a stop we made for it at the double-quick. The rebel pickets opened fire just as we were going over their pits. My orderly sergeant, S. L. Kimball, by my side, was shot through the body at that time. I supposed at the time that he was killed, but, a few days after, learned that he crawled back to the rear. He did not recover however. The rebel pickets probably were glad to move to the rear; at any rate we saw no more of them. We made no stop here, and, pushing ahead, soon came to the Jerusalem [Plank] Road, along which our orders were to advance upon their main line. The enemy’s fire grew hotter. The bullets began to come and my men were falling. Yet we pressed on, realizing that the nearer we approached the more likely were the shots of the enemy to pass over our heads. Reaching the outer margin of the cheveaux-de-frise that fringed the approach to their works, I halted my party to straighten them out and take breath before the final assault. It was now so light that concealment was mostly gone. We had supposed that the main column of attack was moving up behind us at the proper interval and now expected to see it ready for the grapple: but where was it? — nowhere within sight or sound. I had the men lie down close to the ground under the enemy’s guns and, as the light came, began to shoot into the embrasures where they were working their guns. This produced a good effect in distracting somewhat the fire of the enemy and diverting the attention of my own men from their exposed condition. In this situation some unpleasant thoughts began to obtrude themselves, and one of three things could be the only solution of the mystery. The main column had either gone in another direction from our own, or it had not started when the signal was given, or it had started and, when the enemy opened fire, had retreated. I must confess that I have always entertained the last of these conditions as the true one, and was about to state that as what actually occurred. But it is not my province or even my right to state what I did not see, unless it can be substantiated by some official record or other reliable evidence, and my impression was probably wrong. It is more likely that some delay occurred in the start and that the main column did not move up so rapidly as the storming party. The consequence would be the delay now so seriously felt both by the advanced party and by the main column itself in the form of the shelling that was rained down from all the guns of the enemy, direct and cross fire, covering the entire field. In front of us loomed up the formidable fort, belching forth its murderous iron, the very object of our attack. It seemed as if an hour had passed when our ears caught the Union war cry, and we knew that the charge was on. As they appeared in the distance, the storming party and the pioneers crawled up still nearer, rushed forward to the obstruction and cut it away; separated the logs, into which the sharpened stakes were driven and connected by wire; and by pulling out one end of the logs we turned the sharpened points the other way, soon opening a space broad enough for the column front to enter, and then we pushed on for the fort. But here we found another difficulty. A trench had been cut outside the fort many feet deep. The recent rains had partly filled this trench with water. Some of the men fell in as they rushed ahead to climb the high, slanting ascent and were unable to get out and were drowned. All was excitement now. Finding the direct approach impossible, we circled around to the left, and this time, after a sharp struggle in which the troops of the main column participated with us, all in a bunch, we forced our way inside their works. Many prisoners were taken, but many of the garrison ran back behind their inner lines. The cannon were ours and were immediately turned and worked by infantry until a detachment of artillery men was sent up from Fort Sedgwick to handle them. The captured fort being open in the rear we at once became the object of a fierce fire from their inner lines and forts and traverses running back from their outer lines of works. The regiments, after entering the fort, took up the gage of battle and drove the enemy to the left. It was a series of charges and the organizations became intermingled, although fighting with a will. IX Corps Takes Fort Mahone and Vicinity, 5 am-Noon, April 2, 1865. Click on the Map for a Zoomed in View. Parke’s men took Fort Mahone and three other forts in the vicinity, but they were unable to achieve a full breakthrough. The defending Confederates of Gordon’s Second Corps, Army of Northern Virginia, quickly regrouped in the rear and organized for counterattacks. To make matters worse for Parke, veteran Second Division commander Robert Potter was wounded in the initial assault, with the prevailing thought indicating a mortal wounding. Potter was carried to the rear, and Brigadier General S. G. Griffin took over. Parke reported the capture of the first line of Confederate works, but relayed to Grant and Meade that he was unable to break the Confederate lines fully. Grant debated, and after considering the matter, asked Parke via Meade to simply hold his front from 7:40 am on. To borrow an earlier phrase of Grant’s, Parke would hold a leg now while others did the skinning. 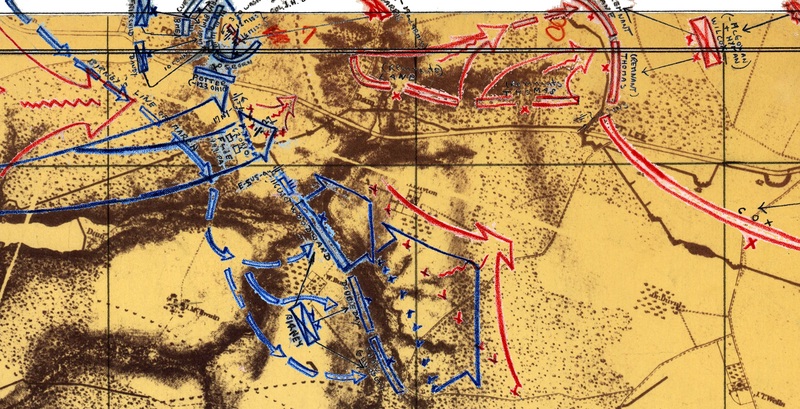 That skinning was occurring further to the southwest, on the front of Wright’s Sixth Corps. As promised, his men “ma[d]e the fur fly” when they got their chance to hit the Confederate lines simultaneously with the Ninth Corps attack. From the beginning, Horatio Wright was more certain of success than John Parke. His men had taken the Confederate picket lines in his front on March 25, 1865, after the Confederates’ disastrous attack on Fort Stedman. This March 25 picket line fighting had given Wright a perfect jumping off point for the attack he eventually launched on the morning of April 2, 1865. Wright, taking no chances, massed all of his Sixth Corps, three divisions, in front of Forts Fisher and Welch. His attack would be a strong, narrow and concentrated one, shaped like an arrowhead and meant to quickly punch an irreparable hole in the Confederate lines from which they couldn’t recover. “In accordance with instructions received from Major-General Meade, an attack will be made at 4 a. m. to-morrow upon that part of the enemy’s line between the house burnt by us on Saturday (the Jones house) and our left. The First Division will take the right, the Second Division the center, and the Third Division on the left; the Second Division being in advance, the First and Third on the right and left being in echelon, the entire formation being by brigade, with regimental front, small regiments being consolidated so as not too much to extend the column, and the Third Division being well advanced, though still in echelon. The divisions, being moved to as near the picket-line as practicable, will advance promptly at 4 a. m. on the firing of a gun from Fort Fisher. The entire picket-line will be advanced at the same time, and that part of it on the right of the attacking columns will gain any point in the enemy’s works that it may be practicable for it to carry, the parts of the line which it may be impossible to advance keeping up a heavy fire upon the enemy. The garrisons of the works from Fort Howard to Fort Urmston, reduced to the minimum, will be maintained, as will also those of Forts Gregg, Sampson, and Cummings, and also the one-tenth of the force in the rifle pits connecting the works named, the line between Forts Urmston and Gregg being abandoned. 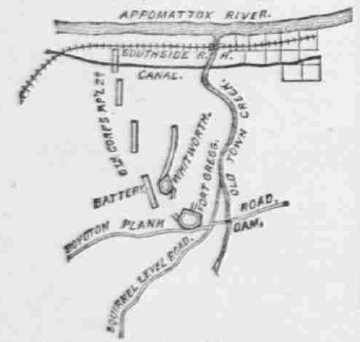 The five batteries already designated to move with the corps will accompany the attack, one being assigned to each division, and the other two being held in reserve while the remainder of the batteries now present will remain in the works to the right of Fort Fisher and to the left of Fort Gregg, as may be directed by the chief of artillery, under special instructions. The troops in the forts on the rear line, to the left of Fort Cummings, will be returned to their commands to-night in time to take part in the attack. Pioneers should be distributed along the front of the assaulting columns to clear away abatis and other obstructions, and the division sharpshooters will be so disposed as to be rendered most effective. The garrisons left behind will be held ready to repulse any counter attack of the enemy, and the infantry promptly to join their commands, and the artillery to go to the rear upon receiving orders to that effect. In forming the column for attack it is recommended that the First Division be formed left in front, and the Third Division right in front, so as to form readily to the right and left, respectively, if necessary. The troops should start from their camps to-night and proceed to the vicinity of Forts Fisher and Welch in time to move to the positions assigned them near the picket line and complete their formation before 4 a. m.
The quartermaster, commissary, and medical departments will be in readiness to conform to the movements above referred to. The necessity of perfect silence in this movement, up to the time of making the assault, cannot be too strongly impressed upon the command. After Wright’s orders were issued, he too faced some uncertainty that evening as Grant worried over Sheridan’s potential vulnerability and asked Meade to have Wright and Parke attack immediately. Wright argued against this, worried the Confederates would be tipped off and better able to respond to his planned sledgehammer blow. Eventually, after Meade explained the situation to Grant, Wright got his way, with orders issued by Meade at 1:30 am for both Wright and Parke to attack at 4 as originally planned. VI Corps Breakthrough, 4:40 am, April 2, 1865. Click on the Map for a Zoomed in View. Wright had broken through Lane’s North Carolinians. The object for which Grant and his army group had been striving for 9 ½ months was finally within reach. With this breakthrough, Lee could no longer hold Petersburg. If Petersburg fell, Richmond would fall as well. Wright had a choice to make as his men broke through the Confederate lines southwest of Petersburg. Should he turn right, toward Petersburg, or left, toward Burgess Mill? He chose the latter, and drove a good portion of Heth’s and Wilcox’s Third Corps divisions to the southwest, away from the rest of Lee’s army. Eventually, Wright was reinforced by portions of Ord’s Army of the James, reversed front, and approached Petersburg from the southwest. But more on that below. Shortly after the breakthrough, as Federal skirmishers probed into the rear of the Confederate Boydton Plank Road line, Confederate Third Corps commander A. P. Hill tried to ride past the damage and rejoin the majority of his corps. He never made it. Two Federal skirmishers had a short firefight with Hill and his aide, with Hill falling dead from the saddle. Another well-known Confederate general had fallen in this chaotic last week of fighting at Petersburg. As Parke’s Ninth Corps gained a foothold in the Confederate works and Wright’s Sixth Corps broke clean through southwest of Petersburg on the Boydton Plank Road line, Robert E. Lee knew he was in serious trouble. 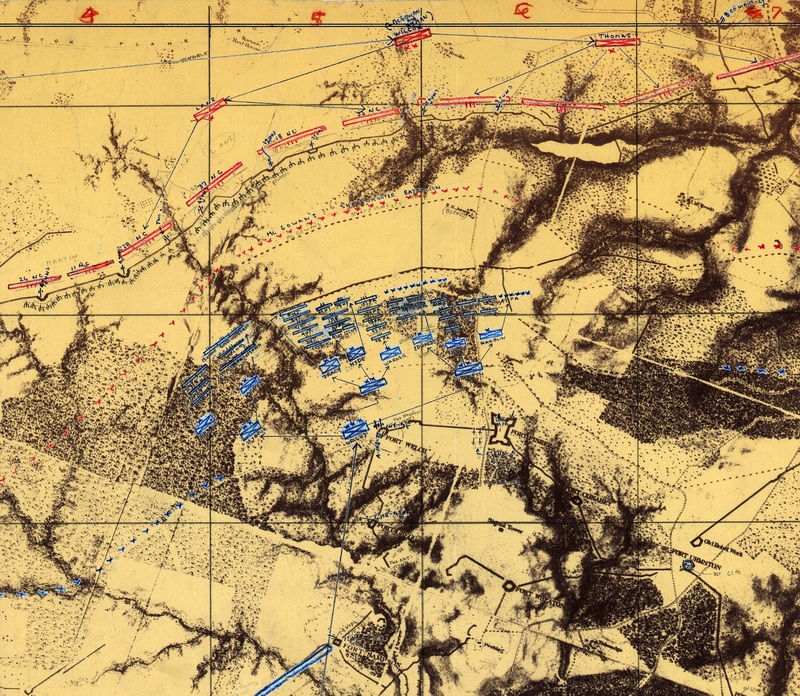 His army was now scattered into five distinct parts, Longstreet and Ewell north of the James, Mahone on the Bermuda Hundred front, Gordon east and southeast of Petersburg with portions of Hill’s Third Corps which had been cut off during the Breakthrough, the remnants of Third Corps and Fourth Corps west of the Breakthrough, and Pickett’s force which had crossed the Appomatox after the disaster at Five Forks. It was all Lee could do to keep his army from disintegrating. During the night of April 1-2, Lee had asked Longstreet to move Field’s Division from north of the James to Petersburg. Worried that Field wouldn’t make it in time, Lee also had Mahone detach Nathaniel Harris’ Mississippi Brigade from his Bermuda Hundred defenses. Before April 2 was out, all of these men would be needed to stave off disaster, and it was a close run thing. The other corps and army commanders along the Union lines were more or less prepared to go to the support of Parke and Wright if they made any progress. The idea was to put pressure on Lee’s entire front south of the Appomattox so that he couldn’t concentrate his Confederate forces against any piece of the whole. In hindsight though, Grant had nothing to worry about. His repeated blows of the past week had left Lee desperately trying to react with less and less chance of success. North of the James River, farthest away from the action, Godfrey Weitzel was tasked with watching Longstreet’s forces and attacking if he saw a significant weakening of the Confederate lines. As April 2 wore on, Grant repeatedly urged Weitzel to attack. He wanted Weitzel to prevent reinforcements from heading south to Petersburg. Weitzel, however, was not a man of action today, citing his 8,000 available troops as too weak a force to do any real damage. He did have Hartsuff skirmish with the enemy on Bermuda Hundred, and he managed to capture the Confederate picket line, but Weitzel didn’t press this advantage and heavy artillery fire drove Hartsuff back. No attempt to take Richmond by a coup de main north of the James would occur this day. To make matters worse, those reinforcements Grant feared poured across the Appomattox into Petersburg. Andrew Humphreys’ Second Corps, Army of the Potomac, began the day divided. After some back and forth on the night of April 1-2, Grant and Meade finally directed Humphreys to send Miles’ Division west down White Oak Road to help Sheridan. This left Humphrreys with only two of his divisions, and he felt too weak to make an attack on the Confederate White Oak Road line. Meade and Grant relented, and Humphreys was instructed to keep an eye open for opportunities. Sheridan, his cavalry, and the Fifth Corps, now under the command of Charles Griffin, were expected to do great things on April 2. Meade expected Sheridan to move via the Cox and River roads near the Appomattox, bagging any Confederates moving west on the south side of the Appomattox. Moving east up the South Side Railroad would have had similar results. For reasons I still don’t fully understand, however, Sheridan chose to move east on White Oak Road, essentially forcing Miles to retrace the route he had just taken the night before. This move caused serious confusion, as Humphreys and Sheridan tried to figure out who was in charge of Miles. Ultimately, neither took charge, and Miles was on his own. You’ll read more about Miles’ exploits this day at the Battle of Sutherland’s Station. After Wright’s breakthrough, Humphreys soon found the Confederates in the White Oak Road line in his front retiring north of Hatcher’s Run. Sheridan approached from the west and also hurried these Confederate forces along. But there would be no major battle in this sector of the field. The White Oak Road line had fallen without a fight, and the noose around Petersburg was tightened even further. Humphreys soon received word to move with two of his divisions, minus Miles to Wright’s aid as the Sixth Corps and Army of the James moved northeast to attack Petersburg proper. Ultimately, Humphreys and his two divisions didn’t arrive in time to help Wright, and they would have proven useful in Miles’ fight at Sutherland’s Station. Sheridan did next to nothing on April 2, a fact often overshadowed by his (really Warren’s) victory at Five Forks the previous day. He used his cavalry and Fifth Corps, a sizable force which could have added to what became a great victory, to instead passively occupy the White Oak Road line after it had been evacuated by the Confederates. If anyone reading this can point me to sources which look at Sheridan’s actions on April 2, 1865, please use the Contact link at the top of the page. In any event, Sheridan could have bagged many Confederates had he done what Meade expected him to do, advancing east much nearer the Appomattox River. His poor performance here was overlooked given the end result here and his subsequent performance in the Appomattox Campaign. As some of you may recall, Army of the James commander Edward Ord had taken portions of Gibbon’s Twenty-Fourth Corps, Weitzel’s Twenty-Fifth Corps, and Mackenzie’s cavalry division southwest to Hatcher’s Run just prior to the Ninth Offensive kicking off in late march. On April 2, his instructions were similar to those of Humphreys. As Parke and Wright attack to your right, keep an eye open for opportunities to advance. Ord soon found just such an opportunity. 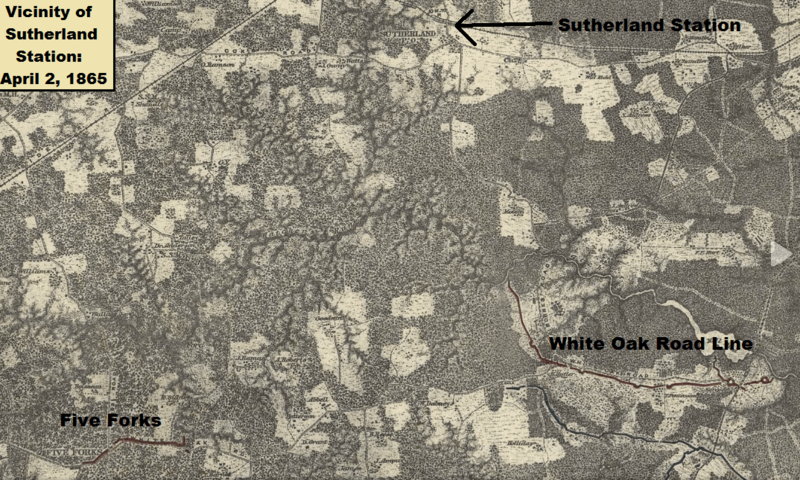 Henry Heth, in charge of the Confederate forces west of the breakthrough, decided to pull his forces on the Boydton Plank Road and White Oak Road lines north to the South Side railroad, to come together in the vicinity of Sutherland’s Station. This pullback meant the Confederate lines in Ord’s front were soon being evacuated. Ord moved forward and soon linked up with Wright’s Sixth Corps, which had headed left, or southwest, down the Confederate lines. By 10 am, Wright and Ord reversed course, moving northeast in an effort to get into Petersburg. Meanwhile, Lee was desperately trying to hold on to the Dimmock Line surrounding Petersburg, which touched the Appomattox to the east and west of the Cockade City. Part of Lane’s Brigade and Wilcox’s division had fallen back toward Petersburg to the northeast, cut off from the rest of Hill’s Third Corps by the breakthrough. Nathaniel Harris’ Mississippi Brigade of Mahone’s Division, fresh from Bermuda Hundred, arrived at the right place and time. Robert E. Lee needed to buy some time in order to fill out the western portions of the Dimmock Line with Charles Field’s Division, but they hadn’t yet arrived. Harris’ men were sent to two earthworks to the west of the Dimmock Line proper, Forts Gregg and Whitworth, with orders to hold off Wright and Ord long enough for Lee to fill the Dimmock Line. Harris’ defense of Fort Gregg was legendary, and is often referred to as a “Confederate Alamo.” It was so legendary, in fact, that Confederates from various forces argued over who had defended it in the decades following the Civil War. This is remarkable when compared to how little remembered the battle is today. Harris had around 350 men in Fort Gregg and 200 in Fort Whitworth. Foster’s and Turner’s divisions of Ord’s Army of the James led the attack on these two forts, with the main attack focused on Fort Gregg. Battle of Fort Gregg, Afternoon, April 2, 1865. Click on the Map for a Zoomed in View. Fort Gregg is located at the top of the map. Fort Whitworth is off of the map to the north. Though two of Harris’ Mississippi regiments and some Confederate artillery had fought desperately at Fort Gregg, Union numbers eventually told, and the forts surrendered. The Union forces lost more men in these attacks, over 700 in all, than the total Confederates who had defended the two forts. Harris had done his job, however. By the time the forts fell, Field’s men were securely positioned in the right flank works of the Dimmock line, and Lee had enough time to safely evacuate Petersburg that evening rather than losing thousands as prisoners during the afternoon and evening. One other action on April 2 occurred far west of the other three combats, at Sutherland’s Station on the Southside Railroad. Henry Heth had ordered the remnants of his command to organize there to escape being flanked by the Union Sixth Corps after it had broken through the Boydton Plank Road line. Confusion between Sheridan and Humphreys over who had control of Miles’ Division of the Second Corps led to neither supporting him. Miles was undeterred by this lack of support and aggressively pursued Heth’s Confederates, moving north on Claiborne Road and eventually confronting the Confederates at Sutherland’s Station in late morning. Heth had left, moving east to take over Third Corps near Petesburg proper after the death of A. P. Hill. This left Brigadier General John Cooke in command of the four Confederate brigades facing Miles. Vicinity of Sutherland Station, including Location of Five Forks and White Oak Road Line, April 2, 1865. Click on the map for a larger image. Miles hit Cooke three times during the morning and afternoon, choosing not to wait for Humphreys’ remaining two divisions to come up from the east in support. Humphreys had essentially been sent on a wild goose chase by Meade and Grant on April 2, not helping Miles at Sutherland’s Station or Ord at Forts Gregg and Whitworth. Despite this, Miles was ultimately successful, his persistence paying off handsomely. 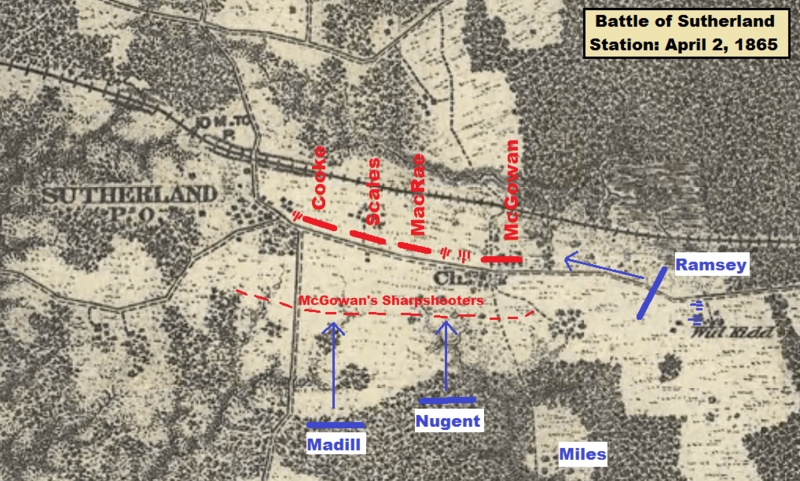 Battle of Sutherland’s Station, April 2, 1865. Click on the Map for a Zoomed in View. “Just before midnight we were relieved by Davis’ Mississippi brigade and crossing the creek, took position in fort Euliss[?]. Here the enemy were on three sides of us—our only protected side being that from which we had just moved—and as soon as day opened [April 2, 1865] they began to fire upon us with both infantry and artillery. Our breastworks were prepared in such a way as, to some extent, to meet these flank fires; but they did not always suit as some of our men were killed that morning by shots which, striking a limb above them, glanced directly downward inflicting death wounds. We could distinctly hear the shouts of the troops, fighting between us and Petersburg, and our feelings would rise or fall in proportion, as we could hear the Confederate “yell” or the yankee “huzza” in the ascendancy. After a while the “huzza” seemed to prevail and soon a courier came dashing into our fort. Very shortly afterwards we were ordered out of our works and in a few minutes were on the retreat from Petersburg. Had Miles been supported and had Sheridan done his job, this entire force might have been captured by Union forces that afternoon. As it was, Miles still achieved a victory, contributing positively to the Union cause on April 2, 1865. April 2, 1865, 150 years ago today, was the last day of the Siege of Petersburg. 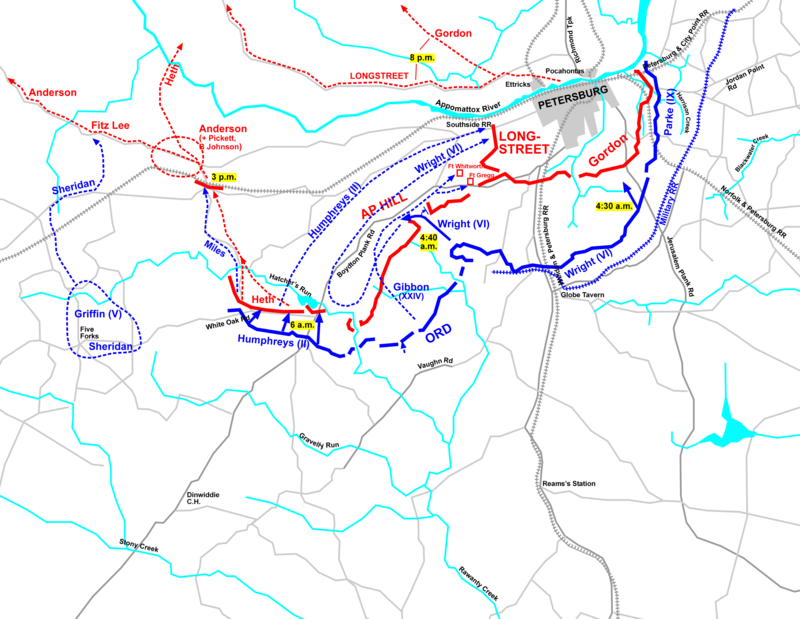 The various fights which together made up the Third Battle of Petersburg had shattered Lee’s lines and made the evacuation of Richmond and Petersburg a must. At the cost of 3,300 casualties, Grant’s armies had placed more than 6,500 of Lee’s men hors du combat, mostly as prisoners. Lee departed both cities overnight, Grant took up the pursuit, and the Appomattox Campaign began on April 3, 1865. Nine and a half months of struggle had finally ended with a massive, and most would say inevitable, Union victory. Unlike some of his predecessors, Grant had never taken his eyes off the prize. He was not distracted when Lee sent forces elsewhere, first Early’s Second Corps, and later infantry and cavalry reinforcements to Early. Instead, he kept Lee in a death grip at Petersburg with most of his force, sending Sheridan, two of his cavalry divisions, the Sixth Corps, and Nineteenth Corps (the latter fresh from the Army of the Gulf) to keep Early away from Washington, D. C., and ultimately to drive him out of the Shenandoah Valley as well. The Northern forces had come very, very close to taking Petersburg several times before, with the best chances on June 15-16, July 30, and September 29, 1864, but Lee’s men had always risen to the occasion and beat back the invaders. By March-April 1865 however, Lee had a serious desertion problem which was rapidly stripping him of desperately needed men. After leaving the trenches of Petersburg and Richmond, Lee would surrender only a week later, on April 9, 1865 at Appomattox Court House. I’d like to thank those of you who spent the sesquicentennial of the Siege of Petersburg following my sometimes rambling and often hurried posts here at The Siege of Petersburg Online. After posting real time for nine and a half months, my engines need a bit of a break to regroup. That said, I’ve got some content planned during my brief sabbatical. Starting after Lee’s surrender, you’ll see the Ed Bearss Petersburg Battlefield troop movement maps start to appear here, one a day, for the better portions of April, May, and June 2015. After that, the future is wide open. I’ve got tons of newspaper articles transcribed by Jackie Martin and others just waiting to be published. In addition, I hope to start looking through and studying various regimental histories, posting excerpts and adding key information to my hundreds of unit pages on the site. Keep an eye out for this content and much more in the years to come. I’ve only scratched the surface of this, the longest and bloodiest campaign of the entire Civil War. I hope you’ll join me as I dig deeper and continue to study this fascinating conflict between Lee and Grant, the two most famous generals of the entire Civil War. Long article . . . but from what I’ve read, it’s very detailed and balanced. I like your descriptions of Sheridan’s actions during the day on the 2nd. Thank you.